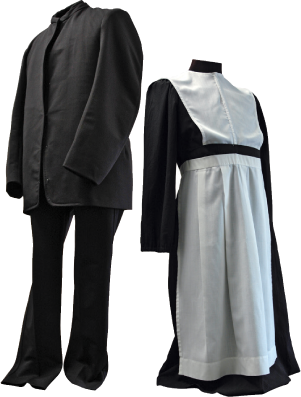 The Amish and Mennonites are an outgrowth of the 16th century Anabaptist movement in Europe. During the Swiss Protestant Reformation, this group of people was considered radical for rejecting infant baptism and mandatory military service. They immigrated to America in hope of religious freedom. Having crossed the Alleghenies by covered wagon, here they settled, farmed, and grew, until today their descendents in Holmes and the surrounding counties constitute the largest community of Amish in the world. 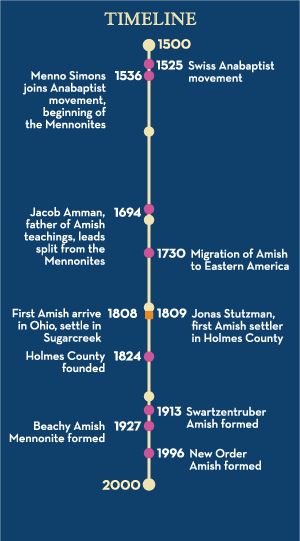 From Somerset County, Pennsylvania, the first people of Amish faith came to Ohio and settled in Sugarcreek in 1808. Amishman, Jonas Stutzman was the first white man to settle in eastern Holmes County, making his homestead in Walnut Creek in 1809. Today 36,000-38,000 Amish live in a five-county region (Holmes, Wayne, Ashland, Tuscarawas, and Coshocton) with their population doubling about every 16 years. Bonnets and prayer caps: Derived from the writing of Apostle Paul, the Amish hold to the belief that women should always have their heads covered with a prayer covering, signifying their acceptance of God’s order of authority in the home. This is a thin white organdy cap with strings either tied or untied. The hard black bonnet worn in public by women and girls is worn over an organdy covering and actually serves as weather protection. Often a heavier one is worn in the winter, and a lighter one is worn in the summer. Bonnets and prayer caps vary greatly in style among the various sects of Amish and Mennonites.